What is the difference between natural, laboratory grown, and synthetic crystals? This is a common and quite significant question. 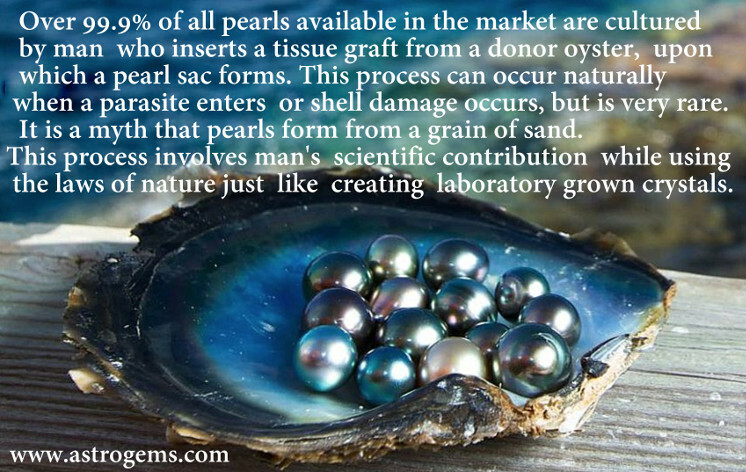 There is in the minds of many people a misunderstanding between the terms synthetic, laboratory grown and natural gems. 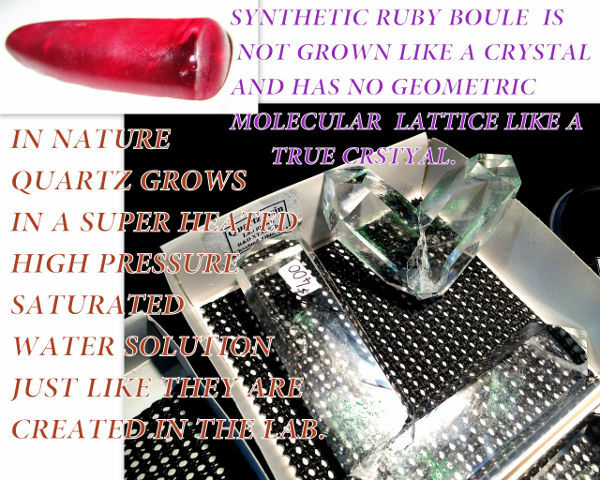 I am the only person that comprehensively offers laboratory grown crystals in emerald and ruby varieties and so I have made an exacting study of their nature. 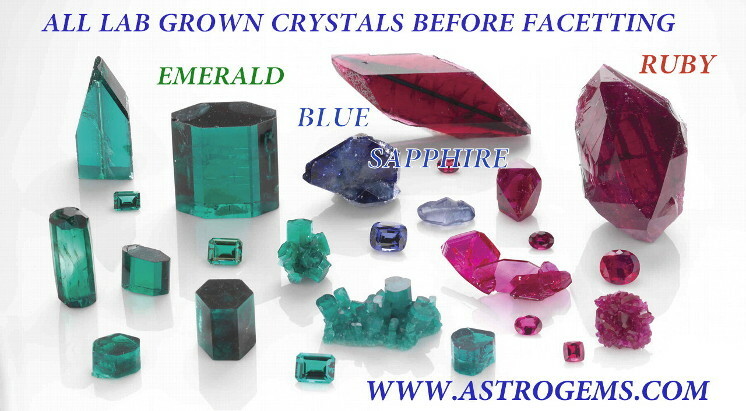 I also sell natural rubies and emeralds and understand their chemical indices. The trade practices act concerning Thomas Chatham and the jewelry industry asserts that if a crystal is grown in a laboratory, as a crystal, it is actually a laboratory grown crystal. Synthetic gemstones, on the other hand, is a term applied to materials that have been melted, but that do not have a symetrical atomic lattice similar or identical to a natural gemstone. Synthetic sapphires and rubies outnumber lab-grown sapphires or rubies by a margin of well over ten thousand to one . But this does not stop the retailers from commonly promoting their synthetics incorrectly as lab grown. 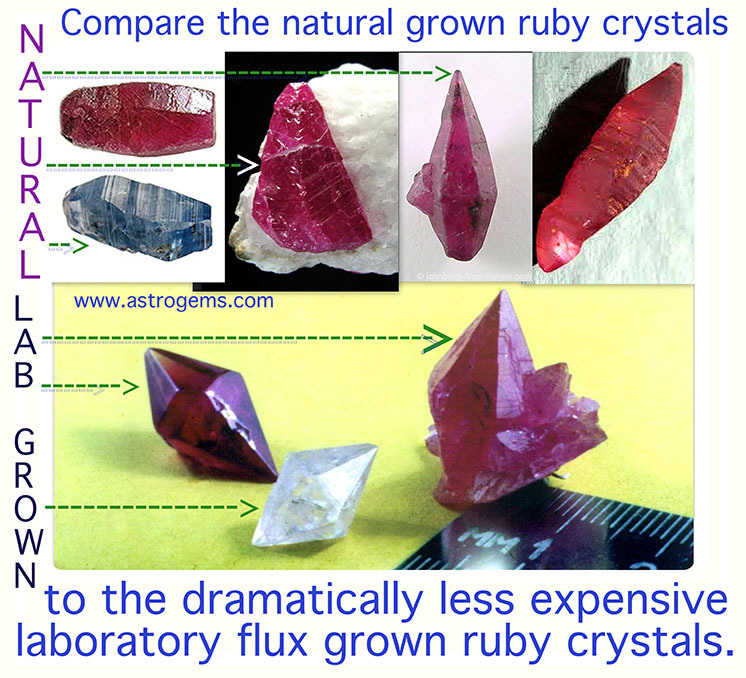 The laboratory growth process can take up to a year for a ruby. There is no evidence to suggest that when a ruby grew near the magma-flow of the same size, it didn't take the same period of time. The very, very important factor to consider is that the laboratory grown rubies are not enhanced or heated to change their color or melt or dissolve their inclusions. 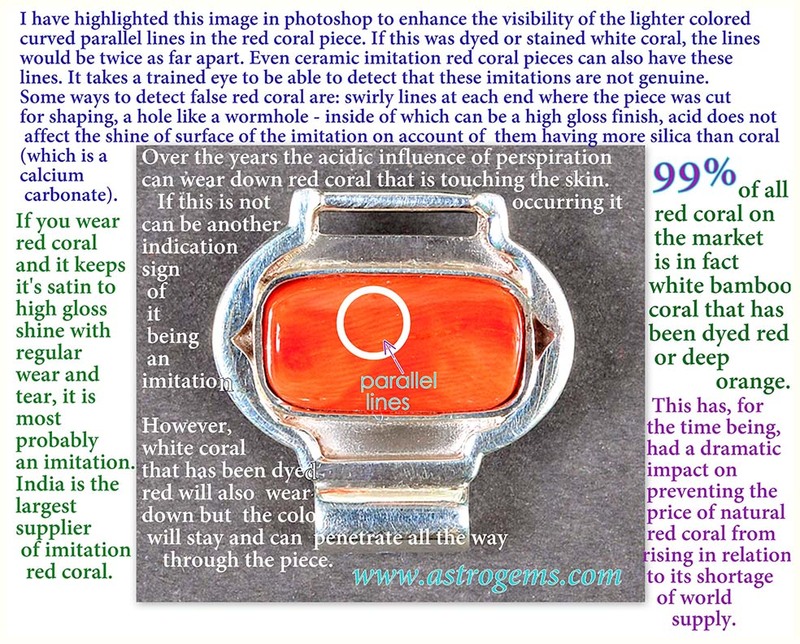 If you have had the time to study the trade magazines on the gem industry, you will realize that there is an extremely high incidence of rubies that are heat-treated, and you cannot always tell, or see evidence of this process. 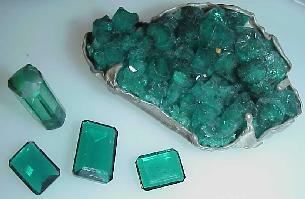 Very, very often if the gemologist can not find evidence of heat treatment, the gem is certified as natural. It's simply not provable. This is why if you send the same batch of rubies to several different laboratories, they will come back with different conclusions as to whether they've been heated or not. A Gemological Institute of America's report appearing in their official magazine corroborates this observation. 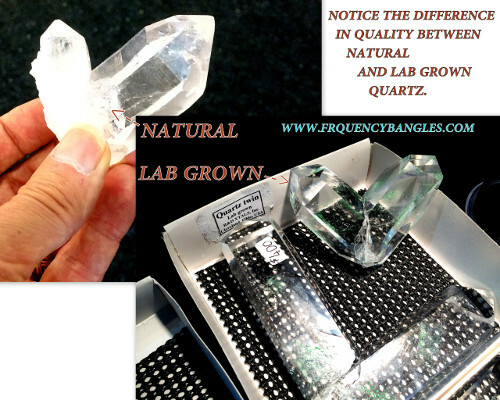 My personal experience demonstrates the comparison between natural and laboratory-grown gems. I recently purchased, on behalf of a client, a four-and-a-half carat emerald for ten-and a half thousand dollars. We bought it at the cutters, in, of all places, India. I submitted it to a GIA for a laboratory report. To this I added my own appraisal. They matched; it was a natural stone, oiled, of particularly good value for its depth of color and clarity. Significantly, it didn't have the depth of green of the laboratory-grown emeralds that I have available for forty to fifty-five dollars a carat. 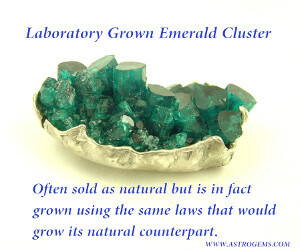 Due to many such experiences, I strongly stand by the laboratory grown emeralds. One of the main reasons is that I've had many people wear natural emeralds, and then transfer to the laboratory-grown emerald crystals cut, faceted material, and those who compared both stones, definitely preferred the results they got from wearing the laboratory grown. 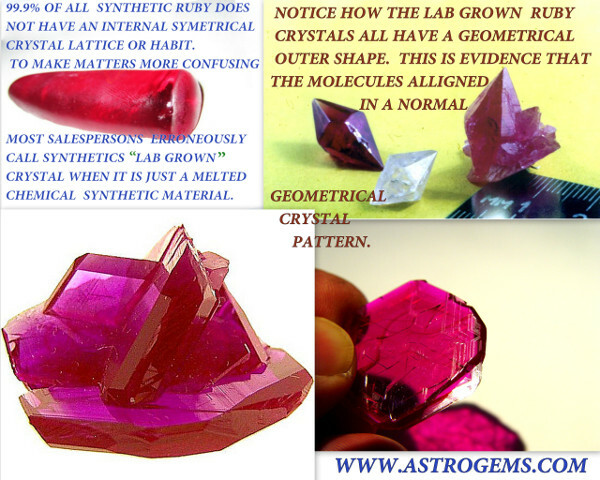 I am openly ridiculed by other gem dealers and astrologers who have not had the same extensive observation I have and thus request the reader to analyze all the scientific data in the scientifically measurable qualities chart in the booklet between the crystals of different origin. and consciousness, when worn in a way that allows for wide skin contact with deeply colored gems. 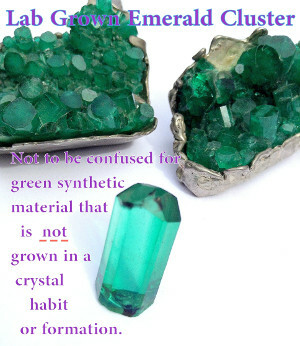 About ten years ago I was being aggressively challenged by some in the planetary gem community over my insistence that laboratory-grown emerald crystals were an excellent substitute for their naturally formed cousins which are more expensive and typically pale and included. The matter had reached a peak of fervor and no matter how much I employed pure science to point out how identical at the molecular level the two differently-sourced crystal gemstones were, my opposition would not agree with me. For years I patiently endured these attacks behind the armor of my testimonial research and scientific inclinations. I was quite aware that, as the first person to tackle openly the old traditions with scientific logic and modern crystal growing technology, I was likely to get some flak, to put it mildly. Some vendors were very upset that I could damage their strong emerald selling incomes. Others just plain refused to see that if we can grow excellent organic tomatoes in a laboratory greenhouse with the right environment of sunshine, soil, and pure water, then the laws Mother Nature somehow will oblige if we create a perfect laboratory environment for growing emerald crystals. (That could sell for only $40 dollars a carat.) Please remember that common synthetic gemstones are not in the category of a genuine laboratory gemstone crystal as they are not made using an authentic, slow crystal growing process. I continued to respond to the criticism with emails respectfully explaining my logic. Still I was banned from joining certain astrological societies, etc. I had always wanted to ask a living master as to whether I was right or wrong about this, but never thought it would happen. Unless I could ask an avatar in the body like Swami Sri Yukteswar or an Anandamayi Ma, I felt this argument was never going to attain complete closure in my mind. This pressing issue was deeply important to me. Even though I was convinced, still I had to admit the possibility that in my human fallibility I could be in error. An avatar is a being on Earth who, like Buddha or Christ, is one with the universal creative spirit and well beyond any kind of intellectual constraints. At the time there was only one living avatar on the planet to whom I could perhaps take this question, to confirm once and for all whether I was right about the karmic effects of laboratory grown crystals. The avatar was Amma and it came about that I was finally able to get her opinion. On a visit to her San Francisco ashram near San Ramon, I took a lab grown crystal cluster with me. I have had the privilege over the years to work with Amma’s charitable gift shop and knew Swamini Amritakrishnaprana quite well, who is her full time personal assistant. I gave the emerald cluster to Swamini and asked to her to give it to Amma. I didn’t feel the need to explain my request to Swamini as I had had many previous experiences with Amma where She knew my concerns before I voiced them and answered them without unnecessary conversation. Swamini handed Mother the emerald cluster during the darshan program, and I let the matter rest until late afternoon the next day. When I saw Swamini then, she told me that something very unusual was happening. She said Amma is given jewelry and other gifts all the time during darshan and constantly passes them on to her assistants, later to be sold to raise money for her charities. But Swamini was surprised to notice that Amma kept the emerald cluster next to Her during the program and seemed to be playing with it. Afterward She took it to her room and even had it at the breakfast table the following day. Swamini said that she had never seen Amma do this before. The next day Amma told Swamini that this emerald material is very good and should be included in the on-tour gift shop as an astrological stone for Mercury. When Swamini told me this, she couldn’t have realized how happy I was to find validation for the Astrogems approach to certain laboratory grown gemstones. Since that time Amma’s gift shop has been promoting and selling laboratory crystal emeralds as the favored Mercury stone to buy, and has asked me about the best source of supply. Sometime later I told this story to one respected astrologer who strongly differed with me on the matter, and his reply was half right. He said that there many charlatan spiritual posers in India, and she had to be one of them. I share his healthy skepticism, but my deeply personal and profound experiences with Amma meant I could not disagree more with his assessment of a saint he had not had the pleasure of meeting. Of course I would prefer to sell faultless natural emeralds if it were practical. But at over a thousand dollars a carat for what I consider to be suitable emerald material, I don’t feel the extravagance is worth it unless the client has abnormal wealth.